A raised intersection slows drivers, in that drivers must slow to avoid physical discomfort. Raised intersection (Hughes et al. 2006). 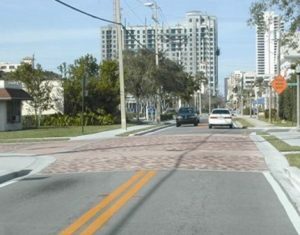 A raised intersection is a raised plateau, usually 3 to 6 inches above adjacent streets (Dixon et al. 2008). A raised intersection slows drivers in a manner similar to a speed table, given drivers must slow to avoid physical discomfort. Cross-section of a typical raised intersection (SCDOT 2006). Ewing (1999) indicated minimal speed reductions, given vehicles may already be slowing for the intersection. In other cases, raised intersections may have the same effectiveness as speed tables. The Crash Modification Factors Clearinghouse provides a crash modification facor (CMF) of 1.05 for injury crashes for raised intersections. Raised intersections can be applied to rural main streets, particularly those with high pedestrian volumes. Raised intersections affect traffic operations, so large trucks and farm equipment should be considered. Installation of raised intersections is a major investment. City of Palos Verdes Estates. Traffic Calming Program. City of Palos Verdes Estates, California, 2001. Hughes Warren, Debra Chappell, and Shyuan-Ren (Clayton) Chen. Chapter 6. Geometric Design Treatments. Innovative Intersection Safety Improvement Strategies and Management Practices: A Domestic Scan. Federal Highway Administration, 2006.